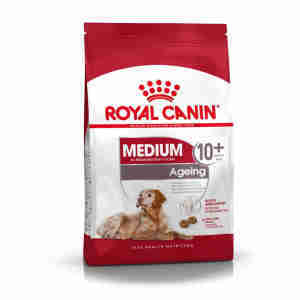 Royal Canin Medium Ageing 10+ is a complete feed for senior medium breed dogs from 11 to 25kg over 10 years old. Medium Ageing 10+ contains a selection of nutrients to support healthy ageing in senior medium breed dogs. It also contains EPA-DHA and an exclusive complex of antioxidants to help neutralise free radicals. Bone & joint support - Helps maintain healthy bones and joints in senior medium breed dogs. Ingredients: rice, dehydrated poultry protein, wheat, wheat flour, animal fats,maize, maize gluten, hydrolysed animal proteins, beet pulp, vegetable proteinisolate*, fish oil, tomato (source of lycopene), yeasts, soya oil, psylliumhusks and seeds, fructo-oligo-saccharides, minerals, hydrolysed yeast (sourceof manno-oligo-saccharides), borage oil, green tea and grape extracts (sourceof polyphenols), hydrolysed crustaceans (source of glucosamine), marigoldextract (source of lutein), hydrolysed cartilage (source of chondroitin).ADDITIVES (per kg): Nutritional additives: Vitamin A: 29400 IU, Vitamin D3: 800IU, E1 (Iron): 52 mg, E2 (Iodine): 5.2 mg, E4 (Copper): 10 mg, E5 (Manganese):67 mg, E6 (Zinc): 201 mg, E8 (Selenium): 0.1 mg - Preservatives - Antioxidants.ANALYTICAL CONSTITUENTS: Protein: 26% - Fat content: 14% - Crude ash: 4.7% -Crude fibres: 1.7% - EPA/DHA: 4 g/kg. *L.I.P. : protein selected for its veryhigh assimilation. Lucky has enjoyed her food now for over two years, recently after dental problems through age we mixed a little tinned fish and softened it up. My border terrier and samoyed tell me this is good stuff! They seem very happy with it and I am hopeful that it supports them nutritionally as they get older. Royal Canin dry foods are good value because they keep well and you aren't paying for added water.